Well, I suppose you stopped by today because you were wanting to see pictures from the Northwest Quilting Expo. I thought so. For now, you'll have to be content with my usual workaday prattle because the quilt show pictures won't be in this post. I'm keeping them separate just to keep it clean...or something. Mainly, I just want to keep it perfectly clear which quilts are of my own humble workmanship, and which ones were made by the big boys and girls. Not that anyone would mistake one for the other. When I got home from the quilt show yesterday, I machine sewed the binding to Vintage Tin. 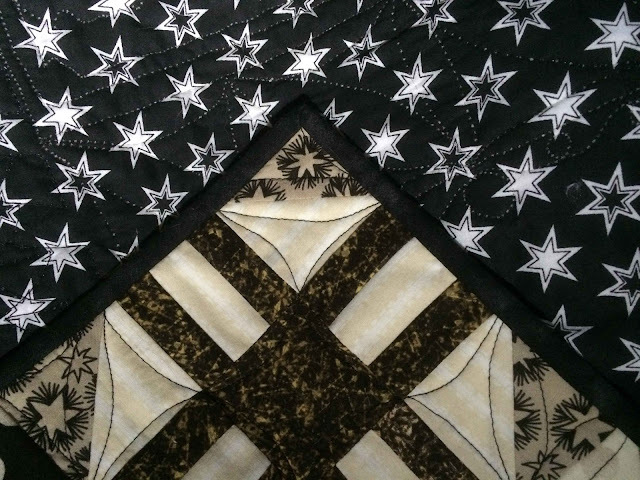 I'm using the same black "marbles" fabric that was used in the flying geese and some of the other pieced blocks. The sashing fabric is another fabric altogether. And since I'm sewing black fabric to black fabric with black thread, you can expect I'll be blind before I'm finished. I got a good start on it this morning, until my headlamp ran out of charge. Believe me, you don't want to be doing this without really good light. I'll estimate I'm about one fourth of the way there. When my headlamp is finished charging, I'll probably get a little more done. And because I know someone will ask, my headlamp is made by Black Diamond. It's rechargeable, and it puts out a nice bright light. The one thing I don't like about it is that it's made for bicyclists and that means it has a flashing red light at the back. It can be turned off, but sometimes I forget. It doesn't really matter except that it runs the battery down faster. It'll last for about three sessions of embroidery for me...maybe about 5 hours...and then it takes a couple of hours to recharge. So anyway...since I know you want to hear about the quilt show, I'll just get on with it. For one thing, I was able to get my hands on an insert that was in our local newspaper the other day. 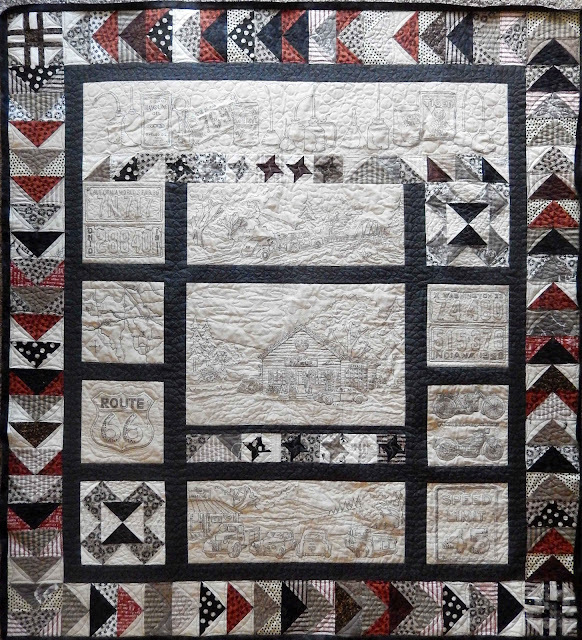 Someone had contacted me to say she was "impressed" that I had a quilt in the show. That got me wondering how she knew. Turns out she saw it in this Oregonian insert. Ha! You can run, but you can't hide. 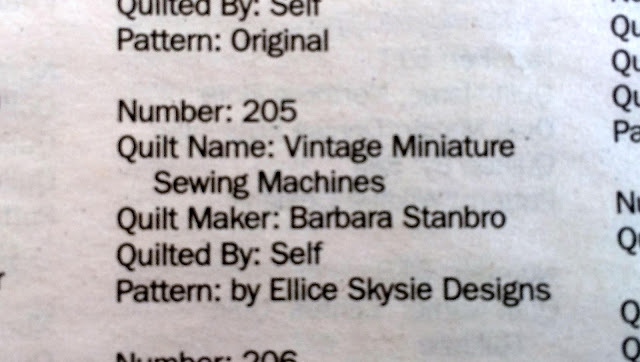 To be clear, the pattern is by Ella & Skysie Designs. Not sure if that error was my bad penmanship, or their bad typing. I tried not to take pictures of everything I saw at the show, but when I took my pictures off the camera this morning, I had something approaching 100 pictures. I won't show all of them to you, but you'll probably be tired of them before I'm finished. It's only fair because I was tired before I was finished seeing all the quilts at the show. It'll be just as if you were there with me, except your feet won't hurt. As I've said before, I enjoy the vendors as much as I enjoy the quilts. I've been on the hunt for a thread I can use when I quilt my Quilting Snowladies. I have some good ideas for it, but whether I can translate them into quilting will be quite another matter. 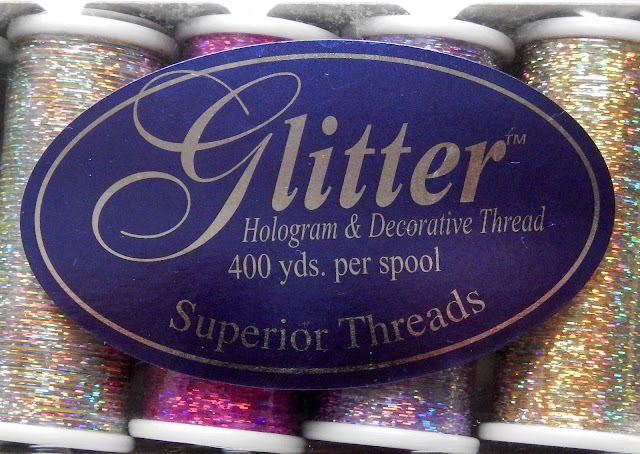 For one thing, I'd like to use a metallic thread to quilt some snowflakes on cornerstones. I've been searching for an appropriate thread that won't drive me crazy (a short drive, to be sure). Fortunately, Superior Threads was there with a booth yesterday, and so I asked for their advice. Their recommendation for my description of the project was the thread in the lower right hand corner of this next image. But I didn't want to limit myself. Why would I do that when my bank account is unlimited? (Pardon me...cough, cough.) So, even though they offered to break up the set for me, I had to buy the whole thing. Those colors were so delicious, I wanted to eat them right then and there. And for good measure, I bought the three spools on top because again, that wallet was so heavy to carry around with all that cold, hard cash bulging from its seams. 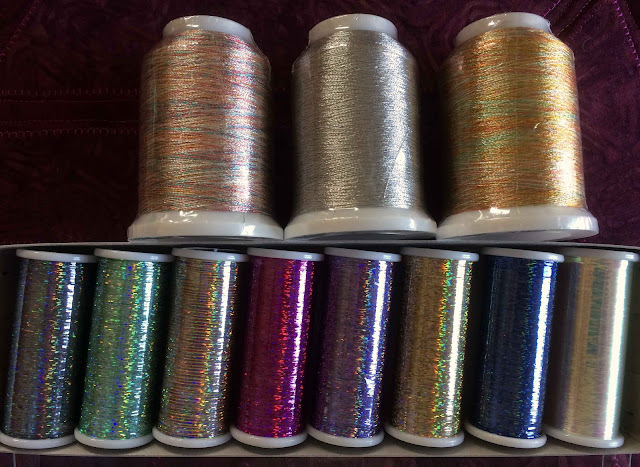 The colors are from left to right, variegated silver, antique silver, and variegated gold. Here's the inside of one of the spools if you're so taken with these you want to head over to the Superior Threads website right now to look for some of your own. Just sayin'. 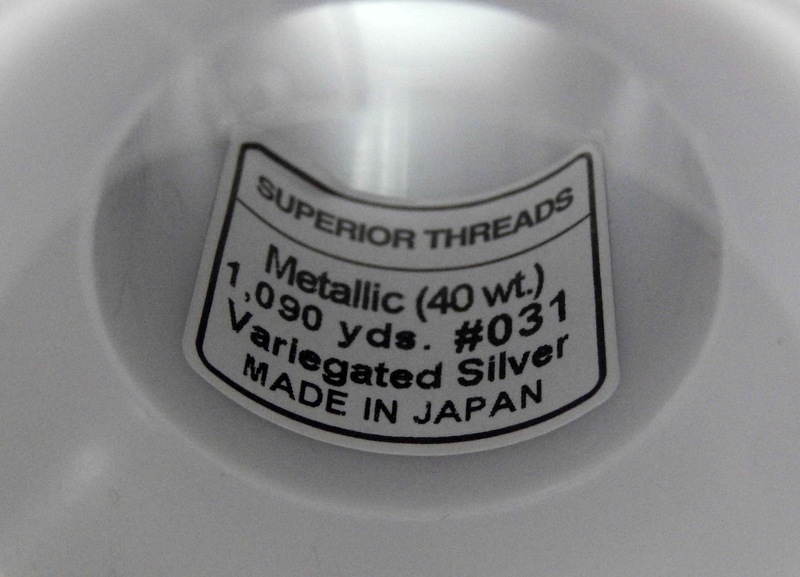 And, yes, I probably do need to have my head examined at being so enthusiastic about trying to quilt with metallic threads, but that's how I roll. I love the glitter, and I am nothing if not foolish...er, determined. Comedic quilting is sure to follow, so if nothing else, you all will be entertained. Tomorrow I'm attending a class at the Northwest Quilting Expo taught by June Jaeger called "A Cat is a Cat". There is a kit fee for the class (in addition to the tuition I've already paid) that includes fabrics, etc. The class description reads "learn June’s paint by number technique and create this charming cat wall hanging." I'm assuming that means the fabrics will be similar to the one in the picture. but I tend to learn better when someone shows me how to do something. It's a three-hour class, and I'm looking forward to it. Maybe I can do my own best kitty friends for some future "Let's Book It" challenge. So with that, I'll get on with the show, but I'll start in a separate post. Stick around. I use the Hologram on my home machine and very pleased with it. I love my Ott light - well, Ott bulb in a clamp lamp that I can move where I want and need. Black on black is a trick. Oh yeah, black on black is so much fun! I gave my friend some light up embroidery hooks to use when she's using black yarn - don't know if she's used them yet or not. More light is always nice though. That thread is yummy looking! I was just reading in an older Generation Q magazine about thread stands & that they're good to use especially with metallic threads. I'll look to see if I can find the article again for you. I haven't done any sewing lately. Wednesday was the first day I got home from the new job & didn't fall asleep for an hour in my chair! But I am liking it there. I'll still be working at the colleges too, on the weekends as needed. That will be my "mad money"! O.K., I laughed way to hard at the visual of you wearing the headlamp with a flashing red light on the back. That class looks like fun, I'd take all the classes I could it's a much better way to learn instead of reading the book and wondering what the heck they're talking about. I'm a fan of whatever works in terms of the lighting department, black on black is so hard to see. Looking forward to hearing the new language you are going to develop while you work wonders with the new quilting threads. But all those extra words are going to be so worth the finished project I'm sure. Yes, black on black is so much fun. I'm about to start one that will be queen size, not sure whether hand or machine quilting will be more difficult, er insane, but a girl's gotta try. I sometimes use my head torch as it means I can work in different rooms i.e sitting in the kitchen stitching whilst John cooks dinner, or when I'm staying away from home. It gives a really good light and certainly helps if stitching black on black. Good choice with the threads they looks so yummy. So exciting to be so close to a finish on Vintage Tin!